Lawmakers lined up along the walls of the Governor’s Reception Room, waiting to stand behind Gov. Larry Hogan as bills they’ve poured their hearts into the past 90-days were signed into law Tuesday morning. Perhaps the most eager of these legislators were the new kids on the block, first-year legislators that made up the largest freshmen class to occupy the State House in 20 years. Reacting to their first session, new delegates reflected on their accomplishments, struggles and future plans. One obstacle faced early on in session, was what more liberal Democratic freshmen called a “broad-brush characterization” of them as a body. In response to a negative comment made by a lobbyist, calling the freshmen class “anti-business,” the new legislators banded together to formulate a response. The bold stance of the freshmen made an impression, with the lobbyist later apologizing publicly. “This session met my expectations in a lot of ways, it was fast paced, it was exciting, it was at times unpredictable, but also it was just a tremendous experience as a freshman,” said Del. Christian Miele, R-Baltimore County. The delegates unanimously agreed senior legislators helped them to adapt quickly and learn the legislative process. What stuck out about the process was hearing panels of constituents testifying in committee before the bill reaches debate on the House floor, lawmakers said. “You become a subject matter expert very quickly,” said Del. Andrew Platt, D-Montgomery and member of the Ways and Means Committee. Holding this knowledge about bill topics helped in resolving issues before they reach the House floor. However, some bills lose their footing in committee, never making it to a vote on the House floor. “While I was able to get a couple of bills passed and learned how to work the bills through the process, I was very disappointed that the legislature did not deal with issues of economic injustice and tax reform,” said Del. Jimmy Tarlau, D-Prince George’s. Tarlau rallied behind the issue of paid sick days, specifically the Maryland Healthy Working Families Act, which got stuck in the House Economic Matters committee. “The issue of paid sick days, collective bargaining rights for community college workers, and tax reform never got out of committee,” remarked Tarlau, disappointed. However Del. Marice Morales, D-Montgomery, believes most legislators are very pleased with the compromises made this session, especially in the budget. Morales reported that newspapers report on the showy-politics side, whereas behind closed doors legislators know the budget they passed is a fiscally responsible one. 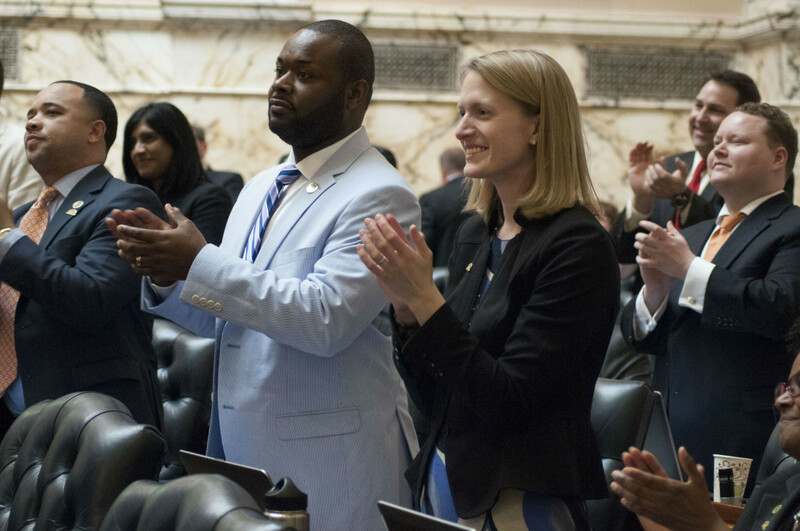 Democratic legislators like Hill were “surprised and disappointed” with the last few days of debate on the floor, when all the Republican delegates and senators who had supported the budget voted against the final version after failed negotiations between Hogan and legislative leadership. “I am disappointed that after all the work the legislators put into coming up with a budget that had historic bipartisan support, that it ended with all the Republican supporters sort of pulling their support back,” said Hill. Del. Trent Kittleman, R-Carroll and Howard, opined that the conference committee working on the budget were the ones who created the partisan-division. Del. Kittleman was “surprisingly unhappy” with the short amount of time legislators were given to review the final budget. “The 70-page document was handed out on the floor and we had, at most, 30-minutes to review it, while continuing to vote on other bills,” said Kittleman. The governor also received criticism from freshmen. “The governor talked about bipartisan cooperation but, in the end, that was not his walk,” said Del. Karen Lewis Young, D-Frederick. Young felt the first budget passed by the House earlier in the session was the best. Perhaps the showmanship on the House floor is unnecessary, opined some legislators. “They could have installed 141 computers on the desks in the House programmed to vote green on every bill and red on every proposed amendment and gotten the exact same result; while saving all 141 of us the enormous waste of time of spending hours every day on the floor,” said West. Being assigned to committees allowed legislators to interact with testifying constituents and work closely with fellow legislators, regardless of their partisanship. One of the most hectic days of the 90-day session, the final, 13-hour day referred to as “Sine Die,” did not intimidate the freshmen. On Sine Die, legislators have until midnight to pass their bills through the House and Senate, any bill stuck in the process will die, unless they are readdressed next year. “I really enjoyed the pace. The people in my district don’t always have two or three years for decisions to be made, They’re hurting right now and they’re expecting their elected officials to produce right now,” said McCray. “I think it’s something we really look forward to, getting that last push of bills to get through to the governors’ desk,” said Lam. Freshmen across the board voiced their enthusiasm for next session, already making plans for new bills or ways to re-attack ones that failed to past this session.